Updated Saturday February 2, 2019 by OBBA. The following are special By-Laws and rules governing the Recreation Basketball League of Old Bridge. The official High School Basketball Rules will apply in any situation not covered herein. Every team must be directed and supervised by an adult coach assigned by the League. If the coach is absent and no responsible adult is designated to act as coach in the coach’s absence, is present, then the team forfeits the game. Eligibility is determined by a player’s grade level starting from 2nd grade through high school. The player’s parent completes a registration form and pays the registration fee. The player is drafted or assigned to a team by the League president or his representative. Team shirts provided by the League must be worn at all games, (Lost shirts must be replaced by the player at the player’s expense). Black shorts are suggested, but are not the official uniform. Players wearing glasses must wear safety glasses or some type of protective goggles. It is suggested that all players wear a protective mouth guard, (Players wearing braces must wear a protective mouth guard). Those players that fall under these categories and do not wear the proper protection will not be allowed to play. No jewelry what so ever is allowed on the court. Have a coach or family member hold onto them until after the game. Official High School Rules - With the exception of specially noted rules below, our League play is governed by official High School rules. Prior to each game a volunteer must be assigned by each coach to assist with score keeping and hall monitoring. Home Team Volunteer –responsible for making sure participants stay in the gym and make sure kids are not roaming the halls. 2nd Grade boys division is instructional. Each game will include a 30 minute practice and 30 minute game. 3rd, 4th Grade boys division and Prep girls there will be a 7 minute running clock, stopped only for timeouts, foul shots and the ref’s signal. 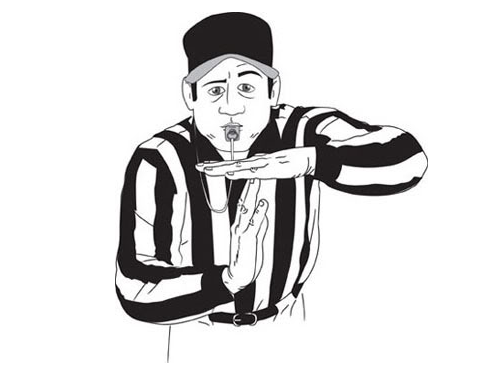 The ref will stop the clock for substitutions in the middle of each quarter. This is not a timeout and the transition should take no more than 15 seconds. The clock will stop in the last 2 minutes of the game. All other divisions will have an 8 minute running clock which stops only as mentioned above. Each team will have 2 timeouts in the first half and 3 timeouts in the second half. No additional timeouts for the first overtime period. These timeouts are in addition to the automatic timeouts provided by the referees. If the score is still tied after the overtime period, the game will go into a sudden death final period - first score wins. Junior, Senior Boys, Senior Girls division throughout the game. 6th, 7th Grade Boys during the 4th period only and overtime. 4th and 5th Grade Boys, Junior Girls during the last 2 minutes of the 4th period and overtime. 3rd Grade Boys and Prep girls No Full Court Pressure Allowed. Players must be allowed to clear the half court line. Defending team must go back within the 3pt arch until the ball has past half court. In the absence of the allowance of full court pressure, a player in possession of the ball cannot be guarded until the ball is advanced beyond the half court line. If a team is up 20 or more points, neither team can press. One warning will be given to each team for illegal defense. The second violation will result in a team technical foul. The counting occurs after the ball advances over half court. 3rd, 4th, 5th, Grade Boys, Prep and Junior Girls - 5 seconds in the lane. All other divisions - 3 seconds in the lane. Once the ball is advanced past the half court line, a violation occurs if the offense returns the ball back over the half court line while still in possession. Although players have the standard 10 seconds to initially advance the ball over the half court line, the ball will not be considered over and back unless it is returned back over the top of the defense’s key while still in possession of the ball. Suspensions: Coaches may suspend players for just cause. Both the player’s parents and the League President have to be notified within 24 hours and if a suspended player is at a game, the opposing coach must be notified of the suspension. Players are suspended for the succeeding game if they are ejected for a game for technical fouls. Coaches are suspended for the succeeding two games when ejected for a game for technical fouls. A written protest is submitted to the League President within 48 hours. Coaches Certification - All coaches must be certified by the Rutger’s Program or the equivalent, with a copy of the card presented to the League for records/insurance purposes. Foul Language – Will not be tolerated. Any player who is caught using foul language by an official will be ejected from the game and a technical foul will be given to the player. Physical Harm - Any player, coach or official who uses physical force on another person will be ejected and suspended for the rest of the season. If this occurs after mid-season, they will also be suspended the following season. Players, who arrive before the end of the first quarter, may play but must play the minimum ½ game if activated by the coach. Players who arrive after halftime are ineligible to play on game night. If the game is suspended and additional players arrive to finish the suspended game, these players may play at the direction of the coach. IMPORTANT - All such players are treated as a group, so a coach may not use discretion to play one or the other, but must play all or none. Unruliness - If a spectator gets unruly and out of control, they will be asked to leave the gym by the head coach of the team their child is on. If they do not comply, the police will be called and the game will be stopped and forfeited.